Down a dark, graffiti-covered alley underneath Waterloo Station, through a labyrinthine series of tunnels with a bar here, a pop-up café there, trains rumbling audibly above, the Vault Festival is taking place throughout February featuring a mixture of plays, cabaret, immersive theatre, stand-up comedy and who knows what else. 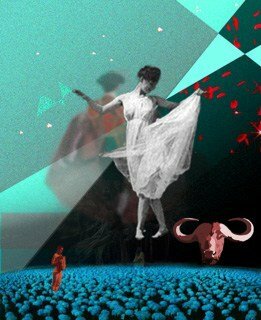 At the end of the tunnel in a surprisingly generously-sized performance space called The Forge, Tangled Thread Theatre is presenting a play about a 1940s female bullfighter, or matadora, called Conchita Cintrón, and a modern-day Londoner named Ruth. Ruth has just been made redundant and her relationship with her partner Sam appears to be on the rocks. At one point she even perches on a windowsill and contemplates suicide. Meanwhile Conchita practises the series of passes, the duende, made by the bullfighter as he/she confronts the bull, under the beady eye of her instructor, Ruy, who turns out to be Portuguese. The link between the two women is not immediately obvious; but we know Ruth has Latin blood, Spanish to be precise, and has a yearning for a rather lurid, or silly, but actually very pretty black and red flamenco dress for sale in her local shop for a fiver. So she buys it, and even over her shirt and leggings it does look pretty, if slightly silly too. Conchita, who is Peruvian, has an ambition to fight in Spain, but it’s not easy to arrange. Ruth takes a reluctant Sam salsa dancing, and he quite enjoys it until he thinks he is being laughed at. At one lovely point in the play all four actors perform their salsa movements together. Conchita finally gets her wish to fight in Spain, but the rules say she must fight and kill on horseback. She defies this rule to dismount and confront the bull face to face, but in the end instead of plunging in the sword for the final kill, she lays it down on the ground and walks away. Meanwhile Ruth is called to Spain to visit her dying grandmother and the link with Conchita is revealed. She was Ruth’s grandmother (or maybe her great grandmother). The two women come together in preparation for Conchita’s final fight. All this is performed with great commitment by the four young players. Paula Rodriguez is a graceful and striking Conchita, Jennie Eggleton – who looks too young to be in a relationship in the first place, let alone a dying one – is a convincing, endearing Ruth, Fed Zanni is a volatile Ruy (though not always that easy to understand), and Josh Taylor plays a bemused, slightly confused Sam. The play is acted out on a bare stage with all-too-brief snippets of footage of Conchita’s fight projected onto a screen on one side. The choreography (Ita O’Brien) is so graceful one can forget that bullfighting, though beautiful in the movement of the matadora, is such a barbaric practice. I was not totally sure what to make of the connection between the two women. We see it most clearly in the movement of the salsa, which though of Cuban invention I believe is not dissimilar to the movement of the bullfighter, the duende: the stiff shoulders, the upright body, the way the dancers/fighters move their feet almost without appearing to. It was the grace of the dance that stuck most in the mind of this reviewer. It is an ambitious project, written (Tallulah Brown), directed (Carla Kingham) and designed (Nina Patel-Grainger) by women, about women. Tangled Thread’s mission is to encourage the new and the young and the innovative, and the production is wonderfully executed by cast and creatives combined. It would gain by being a little clearer – it took me a while to figure out which country Conchita and Ruy were in at any point – and a wee bit shorter. I was glad to be introduced to the fascinating Conchita Cintrón. An interesting company to watch. Spain, 1949. Conchita is about to enter the ring and face her 750th bull. She plaits her hair, she picks up her sword and she prays. Franco’s law has banned women from bullfighting on foot. Conchita is about to take matters into her own hands. One false step and a bull’s horn could pierce an artery, toss her high into the air. She’s seen blood shoot from a matador’s thighs so hard it could have painted a wall. England, 2015. Half a century later Ruth gets back from a salsa lesson, steps up on to her window sill and readies herself to jump. In a split second this modern woman comes face to face with the smallness of her flat, the silence of her bed, her squashed up and sweat-stuck daily commute. Her inability to fight. Her cowardice. Her fear. Her block.